“A grand canyon has opened up in our world”: on one side is the alt-right, on the other, the “illiberal liberals”. This bold claim was made by Stephen Fry in his recent speech to the Festival of Dangerous Ideas, in which he pronounced the death of classical liberalism. On the surface, this appears an unremarkable statement. Politics has always concerned with schisms between two or more differing points of view. Throughout history, from the populists and patricians of ancient Rome, to the Democrats and Republicans of America today, politics by its very nature necessitates a degree of social division. Two key features, however, delineate the nature of politics today from earlier periods of history. The first is how political beliefs and decisions have become entrenched, upheld as though they were holy writ. Consequently these issues have transformed into cultural concerns. Secondly, this ‘culture war’ is being waged by two minority groups who are gradually dominating our public discourse, merely offering a distraction from the genuine, pressing issues facing our country. Democracy can only function with debate and a lively discourse; our dysfunctional politics stems in large part from the breakdown of rational political debate. Neither extremity is any more responsible than the other for this. The alt-right is conspiratorial, seeing not political opponents but fundamental enemies, and seeks to insulate itself from views with which it takes umbrage. The new left, aptly labelled “illiberal liberals”, stir resentment through their forceful, oftentimes aggressive search for conformity of behaviour and thought. These relatively small factions wage ever-increasingly savage war on one another, while the rest of us watch, aghast, from the chasm below. They are driven by anger at their opponents, and this constant preoccupation with the inherent wrongness of the opposition in turn results in the alienation of the majority and the neglect of their interests. When movements focus their ire on supposed injustices – whether they be Jamie Oliver ‘culturally appropriating’ a kind of rice, or a non-existent ‘establishment’ conspiracy against Brexit – the interests of the country at large are sidelined so that either side may air their pet grievances. These groups, on both the left and right, attempt to claim that they are truly representative of the people, yet by expending so much energy on irrelevant issues they demonstrate a distinct lack of care for anyone but themselves. By getting bogged down in a debate on, say, whether a packet of microwavable rice is cultural appropriation, we are creating a hierarchy of priorities in which these trivial concerns dominate in place of issues that the nation actually cares about, such as the housing crisis or the growing problem of social care. We need to reorient our priorities to question whether it is really necessary to have such debates in the first place when genuine, growing problems require urgent solutions. In America, culture war is a daily reality. Both sides besiege the other continually, mostly on matters of little pertinence to people’s lives. Regardless of one’s opinion on President Trump and his policies, it is hard to doubt the strength of feeling among many Americans that they voted for him so that he might make their lives better. 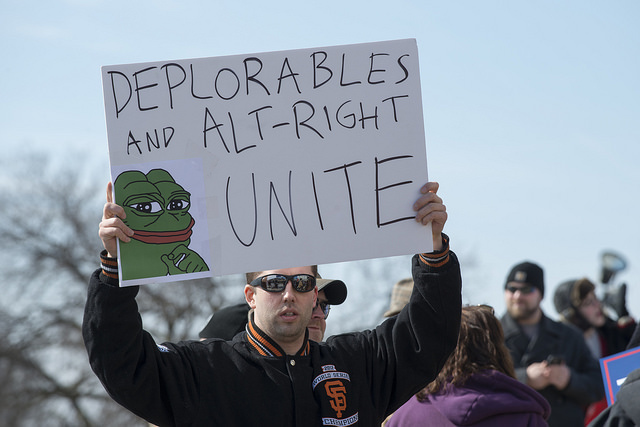 Attempting to castigate such people – ordinary, often low-income people – as “deplorables”, as Hillary Clinton did in 2016 was emblematic of a reluctance to reach out across the political divide to try and win people over. Tribalism is not simply becoming more vicious, but also more rigid. In Britain, we also risk sleepwalking into a similar kind of culture war by refusing to step back and reconsider our priorities. The potential for a culture war is most evident in the ‘Leaver’ and ‘Remainer’ identities which have developed since 2016. Both sides have made unhelpful contributions towards this kind of political culture. The Tory MP Anna Soubry has regularly blanket-labelled Leave voters as racist, whilst David Campbell Bannerman, a former UKIP deputy leader, suggested that those engaged in “extreme EU loyalty” should be charged with treason. ‘Brexiteers’ in particular though, intoxicated by their victory in 2016, have allowed their language to go beyond the realm of acceptability. Phrases such as ‘the enemy of the people’ or the labelling of pro-EU campaigners as ‘saboteurs’ are especially disturbing examples of this. Until both sides tone their rhetoric down, we will continue to head down this path of political self-destruction. This, however, would be a comprehensive dereliction of duty by our political classes. The problems our country faces will only grow the more we quarrel over inconsequential concerns. We need to reconfigure the divisive nature of our debate, and reorient our priorities. Whether you were a Leaver or Remainer, are left-wing, right-wing or centrist: we are much more similar than many of us would care to admit, and its time we remembered that. With the centenary of the conclusion of the First World War having recently passed, it is more important than ever to recall how precious our freedom is to discuss and debate with one another in a civil manner. We should celebrate and share in this privilege together. What do we really want from our LGBTQ+ society?